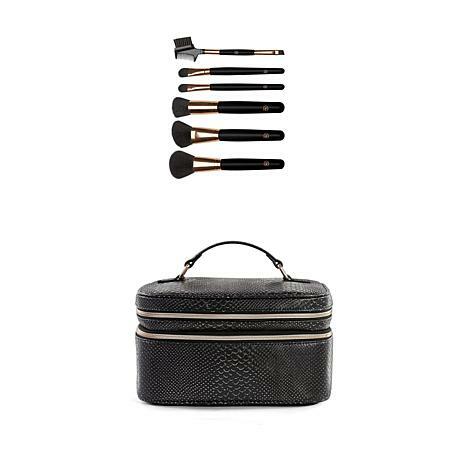 Wherever you're going, go there glamorously with this luxurious, oversized train case and brush set. With various zip compartments and pockets, there's plenty of space to store and organize all of your beauty essentials in style. Make your next adventure even more beautiful. 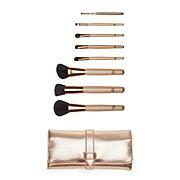 The makeup brushes are excellent and worth the total cost. My makeup goes on better and I never realized that brushes can make such a huge difference! 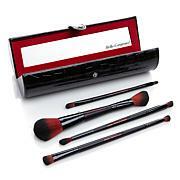 Plus, to throw in a well constructed makeup case, you can't go wrong purchasing this product. 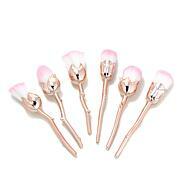 Ordered for makeup brush and extra shadow brushes but makeup brush edge too thin and it had a deep well more for liquid and I use compact makeup. And, not quite the quality I expected: the fibers in the eyebrow brush were bent in alot of directions and some fell out when I touched it. Returned this item .